It’s cold in New Jersey but football fever is HOT with only two days before the Big Game and showdown between the two championship teams. 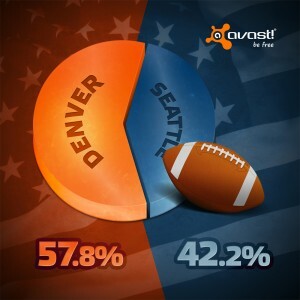 AVAST has joined in the football hysteria by leveraging its vast number of users across the U.S. to help us determine a winner. We posed this question early in the week and more than 45,000 people have since cast their vote. “AVAST has built a large community of people based on its sharing our free and premium antivirus software products, so we turned to our users to help us predict a winner and our AVAST friends in the U.S. responded with gusto,” AVAST product manager, Martin Zima, said. The result is consistent with current polling predictions which place Denver ahead of Seattle for a win on Sunday but not so consistent with picks from furry friends Teddy Bear and Eli who have made accurate choices in the past. Denver has many formidable players, the spotlight of course on quarterback Peyton Manning. Richard Sherman has been the darling of Seattle and arguably the number one defensive player in the league. Some say the outcome for Sunday will be down to the weather and which side best handles the inclement conditions. Here at AVAST‘s headquarters in Prague, we know all about competing in the face of snow, sleet and rain. AVAST wishes both teams good luck on Sunday, and we look forward to a great game.